The second release for Touken Ranbu is coming to the English card game! Bushiroad has announced the second Cardfight!! 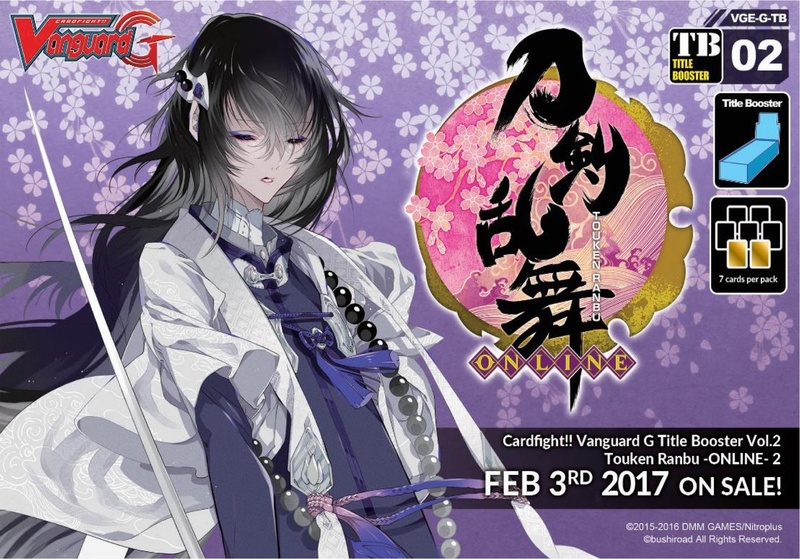 Vanguard G expansion based on the Touken Ranbu – Online online fantasy game, scheduled to release February 3. This follow-up to last year’s Touken Ranbu – Online set (see “‘Touken Ranbu-Online’ Joins ‘Cardfight!! Vanguard’”) will be available in Trial Deck and Title Booster formats. The Touken Ranbu – Online Trial Deck is a pre-constructed 54 card deck, built using 16 different card types including seven new cards and nine re-issue cards. The deck also has four holo cards, a starter’s guide, a playmat, and one Touken Ranbu – Online Trial Booster. The Trial Deck was designed to include all of the cards needed to play, so it can be played right out of the box. Sneak Preview events for the new release will be held on the weekend of January 27 to 29. Participating retailers can order Touken Ranbu – Online 2 Sneak Preview Kits for the event. Each kit includes 32 booster packs (enough for eight participants), 9 Fighter Counters, and 2 rubber playmats. The new set will follow the Ritual of Dragon Sorcery and Divine Dragon Caper, both releasing in December (see “‘Cardfight!! Vanguard G’ Gets New ‘Trial Deck,’ ‘Clan Booster’”).